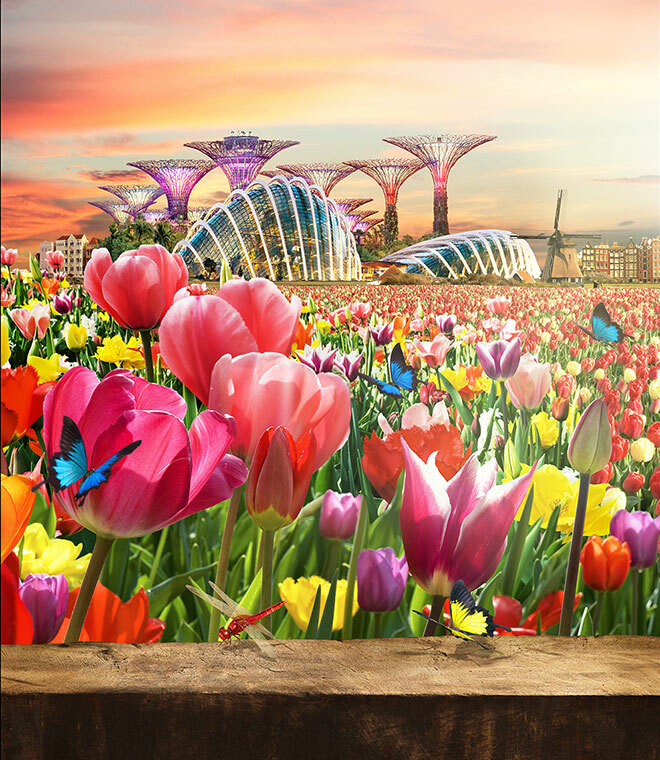 Tulipmania is back at Gardens By the Bay. We had missed last year's event , but we made it up his year by being part of the gardening crew for Tulipmania. Tulipmania opens its doors to public on Monday 14 April at the Flower Dome. Without waiting for the weekend , I had decided to pop in over lunch time during a work day for a peek without the Wackies. If you have been following our instagram or Facebook Fanpage, you would probably noticed that a Little Lego Man had joined our family. He was inspired by Legographer Andrew Whyte . Being the photographer for this journal , I rarely appear in the pictures. Thus this little dude will be my representative in this journal. As for his name , he will simply be known as The Little Brick Man . More about him and his adventures on a later post ! Back to the action at Flower Dome. After so many praises for last year's Tulipmania by fellow bloggers, I was all prepared to be overwhelm by sights of colourful tulips all around the Flower Dome. Alas, that did not happened. Perhaps the timing was not right as only half of the Tulips are blooming at the Flower Bed during the visit. At the entrance, you would be greeted by little KLM houses on display. These houses are actually given to KLM Business class passengers. Do you know that some passengers specifically choose KLM as their choice of flight just to get the houses? The Flower Dome is transformed to a little Holland during Tulipmania. Other than Tulips , Windmills are also found everywhere. Do you know that tulips started from a bulb that was cultivated for at least 7 years before they start to bloom. Given the beauty it creates, it is worth the wait. Other than Tulips, there are Hyacinths of various colours in the mix. These followers are pretty to look at, but do note that handling Hyacinth builds are mildly poisonous and can cause skin irritations. There is one new rare species of Tulips in the gardens this year. Look out for the Black Tulips or 'Blackjack' as they are affectionately known. Too bad it was not blooming when I was there. You would probably find a lot of photographers trying to get a good shot. Little Lego Man was no exception. Probably most are looking to participate in the Tulipmania photography exhibition and competition. More information available here. For photography tips, you can also include the props around the gardens for inspiration. Just take note not to trample on the tulips while taking your photos. Anything for a good shot? The best time to visit would probably be this Easter weekend. The Tulips are expected to be in full bloom by Sunday. Fret not if you miss this weekend. Tulipmania will be on till 4th May. There will be 50000 bulbs in total , so there should be sufficient builds to replace those blooms once it starts to wither. Do not go too early or you may be disappointed with the blooms . The picture below was taken yesterday. Not full bloom yet ! As for the family, we may just pop in this weekend to take a peek . See you here! Lastly, we heard that Miffy ( and probably a KLM flight attendant ) will be there at the Flower Dome during the Easter Egg Hunt sessions. So get your cameras ready!